Panther Westwinds was founded in 1972 by Robert Jankel to build low-volume sports and luxury cars in Surrey. The J72 was the first car from the company and it combined a little of both luxury and sports car. 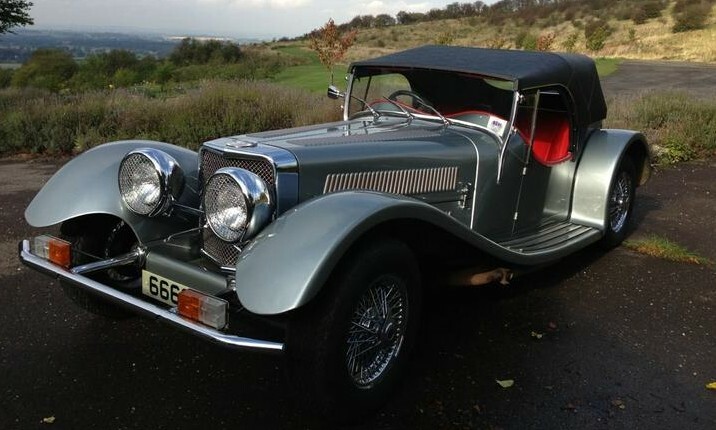 It was not a kit car, but rather a full production car with styling reminiscent of the Jaguar SS100. It was not a replica either and it preceded the wave of “nostalgia cars” (aka neo-classics) by a solid five years. It did, however, use Jaguar engines. You could get a 5.3-liter V12 or your choice of two Jaguar straight-sixes. This one has the 4.2-liter I6 (a 3.8 was also available) that makes somewhere around 240 horsepower. The J72 was produced from 1972 until 1981. In total, 368 were built and this one has been owned by its current owner since new. It’s a 7,000 mile car that has seen extremely light use in the past 10 years. This is a rare, unusual and cool car for only $29,000-$35,000. For more information, click here. For more from Bonhams at the Great Yorkshire Showground, click here. This entry was posted in Uncategorized and tagged 1975, auctions, Bonhams, cars, classic cars, j72, panther, roadster by classiccarweekly. Bookmark the permalink.